Bring Your Event Management into the 21st Century [Webinar] | Certain, Inc.
Every day when I open my social channels or email, I’m barraged by news of the latest cool and innovative technology that brings us closer to complete digitization. While I am awed by how rapidly digital transformation is progressing and how much it is impacting B2B marketing, I can’t help but think that there is still one marketing program that hasn’t yet caught up—in-person events. Even though events often make up the lion share of marketing budgets, (18% on average according to Forrester), they are often run as one-off, individual campaigns. Given the importance of events as a catalyst for building deeper and longer relationships with your customers and prospects, why aren’t they being managed more strategically and tied into your overall digital transformation? When you treat events tactically, you increase the manual activities involved pre, during and post event. You end up focused on the wrong metrics – like registration numbers and logistics, instead of what truly drives your business forward – leads, conversions and revenue. Additionally, many of the technologies supporting your events are also not fulfilling the promise of digital transformation. Event technology is often not well integrated and the various point solutions many companies use require highly manual processes to aggregate data from events, cleanse that data and load it into campaigns to do follow up. This creates lag time in follow up and, as we all know, every hour you delay in following up with event attendees is a missed opportunity to provide a relevant message or offer. More sophisticated teams are beginning to look strategically and holistically at their events—not just as one-off, singular campaigns—but with an overall strategy tied to their unique digital transformation efforts. Given the success of events as a key driver of demand, events must be integrated into your overall marketing strategy. 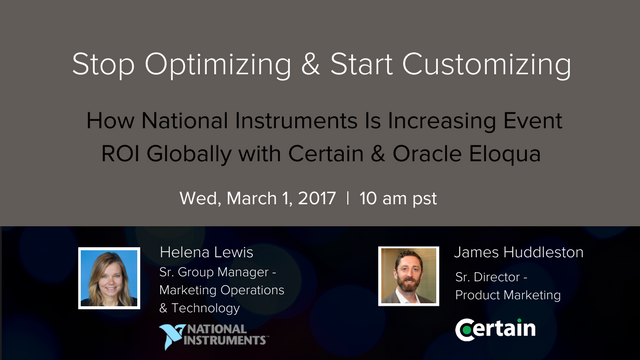 To learn more about how leading companies are assimilating events into their digital transformation initiatives and driving increased operational efficiency, please join us for an upcoming webinar with Helena Lewis, Head of Marketing Operations and Technology at National Instruments. When: Tomorrow! Wednesday, March 15, at 10 am pst.